For three quarters it looked like the Warriors would cruise to yet another big win over the Okkodo Bulldogs as they led the game as many as 25 points in an action packed IIAAG Boys Basketball Friday. 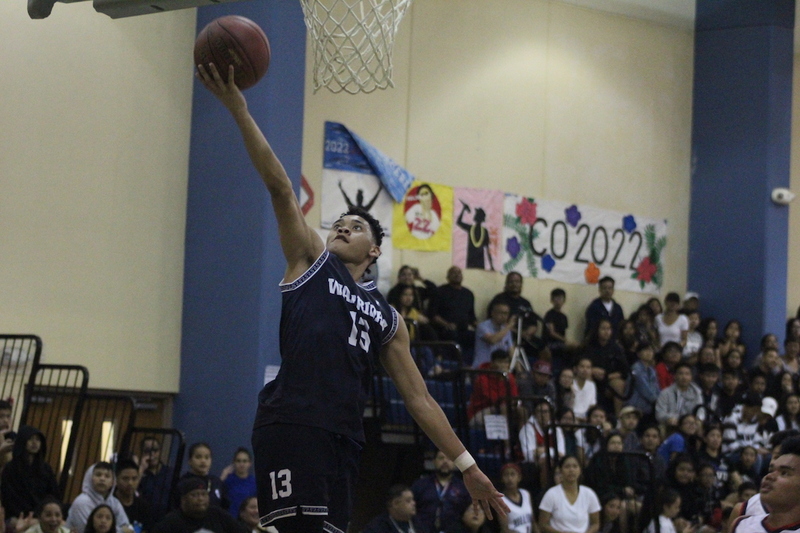 Okkodo refused to go away by putting together one last rally to get within a single possession in the 4th quarter. Bulldogs Alvin Aromin opened the 4th Quarter with a 3-pointer to cut the deficit to 16 at 58-42, which would give Okkodo some momentum after a rough three quarters of shooting. Warriors Jahmar White answered on the following possession with a layup in transition. Several plays later, Aroman would have another opportunity from deep and converted, which shrunk the deficit to just 13 with 5:13 left to play. White would be sent to the line after being fouled, converting on both free throws to put his team back up by 15. But a big mid-range jump shot off an offensive rebound by Bulldogs Kevin Cabral would give the Bulldogs hope with some time to work with on the clock. Nico Bonita would come up huge in the Bulldogs rally attempt, hitting several huge shots from beyond the arc to claw away at the Warriors lead. The first three by Bonita cut the lead to 10 at 64-54. A possession later, Bonita took a deep three with two defenders on him, falling away and converting on the attempt, causing the home team’s crowd to erupt with excitement as the lead was cut to seven. Prior to Bonita’s last three pointer, Warrior Reo Aiken, would have a huge defensive play, blocking a shot in the interior. Bonita’s last three occurred with a minute left and would put the Bulldogs within three at 65-62. The first half was dominated by the Warriors high energy defense and explosive offense. St. Paul’s defense caused so many turnovers in the first half alone, making it very difficult for the Bulldogs to be efficient. Reo Aiken opened the game sinking two three-pointers and would be efficient from deep all game long. Aiken’s efficient shooting from deep and big efforts on the defensive end in the final minutes earned him Wendy’s Player of the Game. Jahmar White’s transition I.Q. was on display for the game, dishing off plenty of beautiful assists to teammates after drawing defenders in on the fastbreak. Despite the Bulldog’s big rally, the Warriors kept their composure, their defense made the necessary adjustments to slow down momentum. Bonita would have two more opportunities from deep, but St. Paul’s defense was air-tight, which allowed them to secure possession and put the game out of reach off of efficient shooting at the free throw line. Aiken explained what went on in the huddle during those final minutes.